Here is the final part of Beth’s Beauty Within series. Each part has blessed me to read and I’m amazed at how the piano has turned out! If you missed the previous articles, scroll to the bottom and click the links. Definitely worth your time! The Lord spoke something to my heart recently. It rings true especially in this situation, He spoke to me that “He would not take something out of my hand if He did not intend to give me something better.” This is like the story of Abraham and Isaac: when God asks to lay something down, He is prepared to replace it with something else. Abraham was ready to thrust a knife in Isaac, knowing that the Lord made a promise to him that Isaac was his heir and if he was killed, then God would raise him from the dead. I don’t know about you, but for me, it is hard to trust at such a deep level. 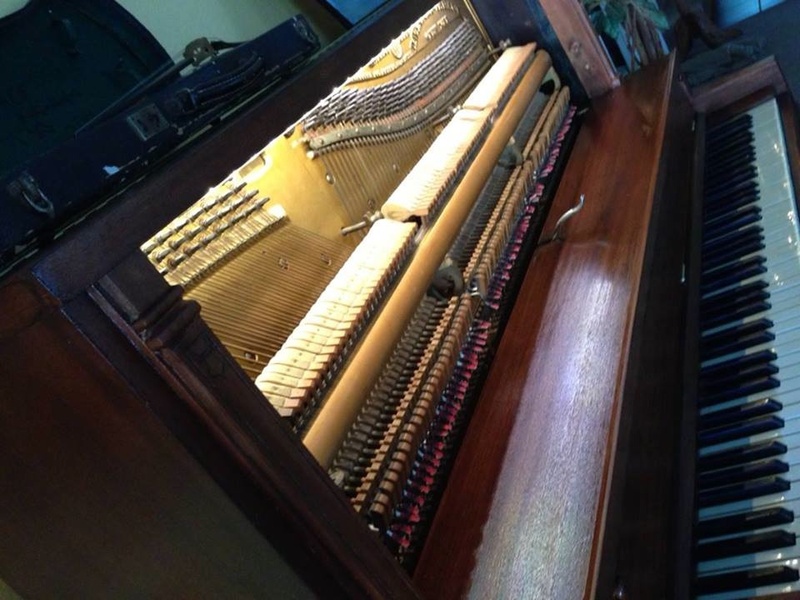 As for the piano, it was the beginning of restoring a dream. I had given up on it, but He begun to use many others to revive this dream in my heart. It started with the young lady who was the first spark. Then there was another young man who visited my home while I was working on the piano. He loved to worship God, and he played the guitar often while he was here. He helped me to see how much I enjoyed worship being a focus in my home. I realized that I wanted it to be the center of the house. So it made me rethink where the piano was to be. I have a front room that is more of an office, and I had bookshelves in the living room, and the piano was in the office. 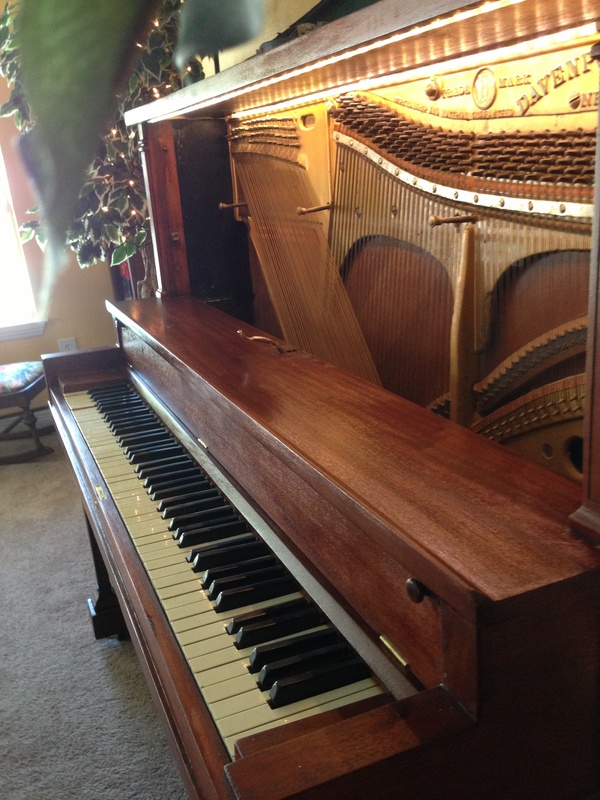 As I neared the completion of the piano, I could see the beauty of God’s glory shining through this instrument. I wanted it to go in a place of honor in my house. So, the bookcases got moved into the front room, and the piano took center stage. On the day the piano man came to put the insides back in, I had another young man visiting. 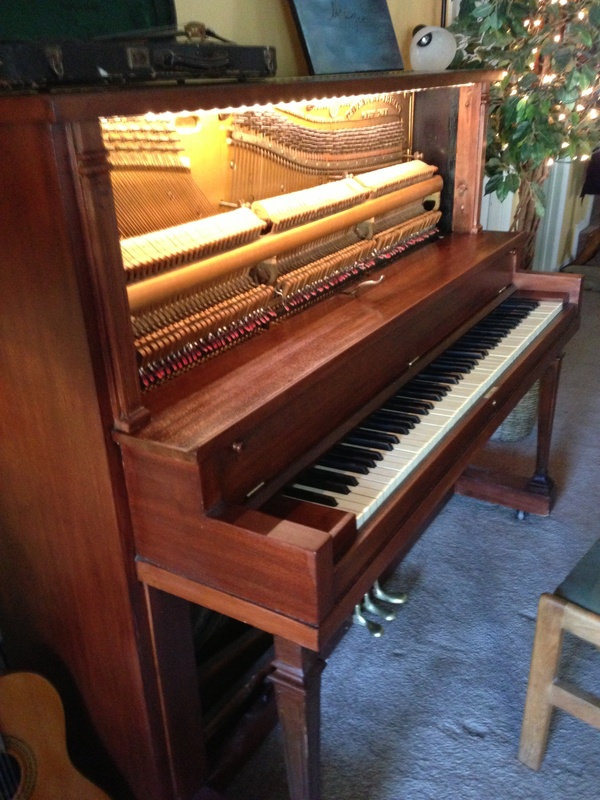 The piano needed to be played, but I could not really “give it a spin” (remember I had laid down that dream). There is one more piece to this puzzle I need to share here. You see, in the last couple of months that my husband was alive, there was a very dear friend who had a degree in Music Therapy; she played the piano beautifully. I asked if she would come to our house and play sometimes if she had free time. She would come once a week. She did not always know when she could come and did not always tell me when she was coming or going, but when she was there it was beautiful. One of my favorite songs she played was “Claire de Lune”. Those times were the times where I felt the greatest peace in that season. Fast forward to the present: we are standing in my living room, and the young man staying with me says he knows two songs by heart, the first one he starts playing was “Claire de Lune”. I wept as I stood there, with chills going down my neck and arms. God was in this place, and I felt as if something deep inside me was being moved and awakened. I knew at that moment, someday soon, I would play the piano. Worship had restored, a greater peace, in my life. Worship in a house, brings peace. We see the example of this in the Bible with David and Saul. When Saul was tormented, and as David would play his harp, peace would come over Saul. Isn’t that the feeling we all get, when we worship? It brings peace to our hearts, which in turns helps us to have a greater beauty come from us. I am grateful to God for the journey He has walked my piano and me through. Not only did He work out a greater beauty in my piano, but He has worked out a greater beauty in my heart. God has truly helped me to find the beauty within. May the Lord help each of us, to find a deeper beauty in Him. 15 Aug	This entry was published on August 15, 2013 at 11:44 pm. It’s filed under Thursday's Thoughts and tagged cancer, devotionals for women, encouragement for women, furniture flip, furniture restoration, loss of a loved one, old to new, piano restoration, WhoIsBeautiful. Bookmark the permalink. Follow any comments here with the RSS feed for this post.